Mens Red Chapter Death Glory Premium Rocker T Shirt featuring a Western Gunslinger skull tattoo design with an Ambigram of the words that reads Death when read in one direction and as Glory the other way. 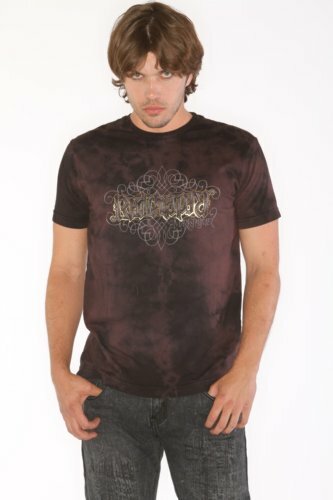 This shirt is in a Brown Mineral Wash color and is very soft from specialty treatment washes and is accented with Gold Foiling Details on the Ambigram. The artists at Red Chapter Clothing create unique clothing designs showcasing Illuminati stylized Ambigrams. Ambigrams are lettering works of art that can be read both forward and upside down. The artists at Red Chapter create wearable art with amazing artwork as a background that showcases an asymmetrical Ambigram design. Red Chapter embraces Duality in their designs as each shirt design has an ambigram showcasing the dual sides of life.